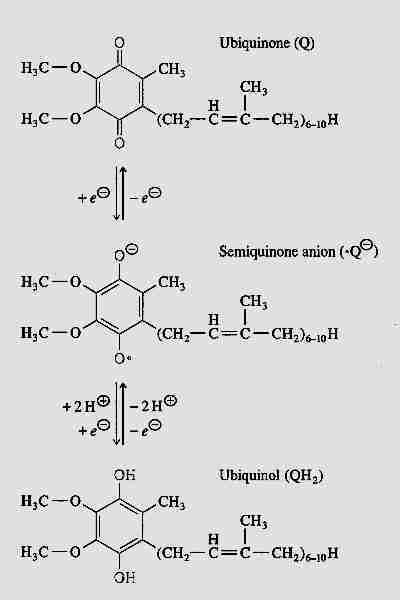 Ubiquinone (so-called because of its ubiquitous presence in organisms) is 2,3-dimethoxy-5-methyl-6-multiprenyl-1,4-benzoquinone — also known as CoEnzyme Q (CoQ10, Q). The reduced form (QH2) is called ubiquinol and the partially-reduced free-radical form (.Q-) is called semiquinone. The quinone group allows CoEnzyme Q to function as an electron-carrier, while the highly hydrophobic tail of isoprene units helps to confine CoEnzyme Q to lipid-rich areas of cells. In most species the number of isoprene units is between 6 and 10. CoEnzyme Q in mammals either has 9 (CoQ9) or 10 (CoQ10) isoprene units. In mouse & rat nearly 90% of ubiquinone is CoQ9, whereas rabbit, pig, goat, sheep, cow and horse have predominantly CoQ10, with 4% or less of CoQ9 [JOURNAL OF BIOLOGICAL CHEMISTRY; Lass, A; 272(31):19199-19204 (1997)]]. CoQ10 is also predominant in guinea pigs and humans. Energy production in biological cells occurs in the mitochondria by a process known as oxidative phosphorylation. The phosphorylation unit combines oxygen and hydrogen to produce H2O and high-energy ATP molecules. The oxidative unit consists mostly of a series of protein complexes in the inner mitochondrial membrane known as the respiratory chain or as the electron transfer chain. Hydrogen atoms are known as reducing equivalents because hydrogen has such a weak hold on its electrons. So the passing of hydrogen atoms along the respiratory chain is equivalent to the passing of electrons. CoQ is the only component of the electron transport chain that is lipid rather than protein, and CoQ is the only component that is not anchored to the inner mitochondrial membrane. CoQ is so hydrophobic, in fact, that it usually shuttles back and forth laterally in the middle of the phospholipid bilayer without getting close to the polar phosphate groups on the edges of the membrane. CoQ picks up reducing equivalents from protein Complex I and protein Complex II and shuttles these "electrons" (as CoQH2 = QH2) to protein Complex III and then returns (as CoQ = Q) to get more more reducing equivalents (the "Q cycle"). Most of the free-radical damage to cell molecules result from superoxide anions (.O2-) that are created from electron leaks" from the respiratory chain — primarily at Complex I in the brain and at Complex III in the heart. Most of the superoxide produced at Complex III apparently comes from the spontaneous combination of oxygen with semiquinone (.Q-) [JOURNAL OF PHYSIOLOGY; Turrens, JF; 552(2):335-344 (2003)]]. Superoxide leads to creation of hydroxyl and peroxynitrite free radicals that attack proteins, lipids and nucleic acids. Most anti-oxidants function by becoming free-radicals as a result of scavenging free-radicals. The anti-oxidant action is a consequence of the fact that the radicalized anti-oxidant molecules are more stabile free-radicals than the original free-radicals. CoEnzyme Q, Vitamin E and Vitamin K are all structurally similar in having an electron-accepting group attached to a chain of very hydrophobic (lipophilic) isoprene units. Of the three molecules, CoEnzyme Q has by far the most isoprenes, is by far the most lipophilic and forms the most stable free-radical. The CoEnzyme Q free radical is so stabile, in fact, that its formation is a normal intermediate between ubiquinone (CoQ = Q) and ubiquinol (CoQH2 = QH2). Only in a small percentage of cases does the CoEnzyme Q carrier fumble its electron to form superoxide. CoQ10 is only very slightly more efficient than CoQ9 in this regard [JOURNAL OF BIOLOGICAL CHEMISTRY; Lass, A; 272(31):19199-19204 (1997)]]. Normally most of the CoEnzyme Q is in reduced form (ubiquinol, QH2), which is the form that is most effective as an anti-oxidant. 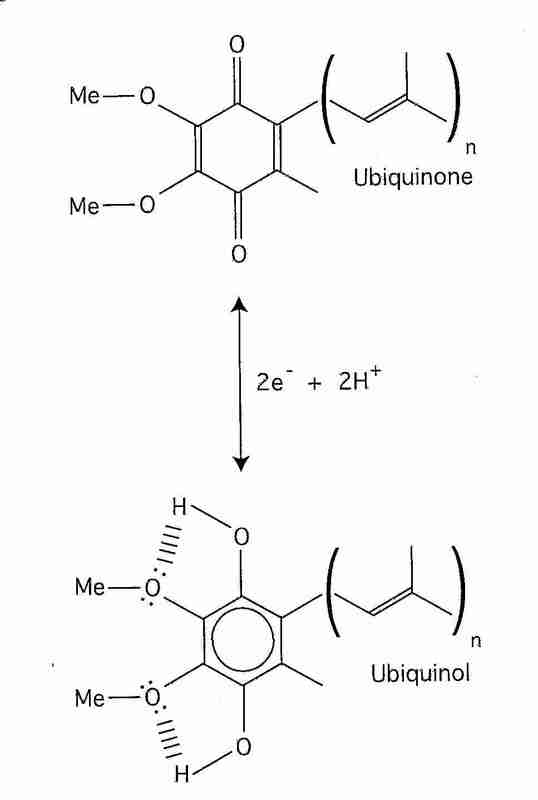 The ubiquinol (QH2) can neutralize a lipid peroxyl radical by donating one of its hydrogen atoms to become the free-radical semiquinone (.Q-), which is then restored to a non-free-radical state by the respiratory chain Q cycle. QH2 or .Q- can also regenerate the Vitamin E tocopheroxyl radical by electron donation. Vitamin E is actually more effective as a mitochondrial membrane anti-oxidant than is CoEnzyme Q because Vitamin E neutralizes lipid peroxyl radicals far more readily and because Vitamin E is less hydrophobic, allowing it to more freely move throughout the mitochondrial membrane. CoEnzyme Q is more confined to the center of the phospholipid bilayer [METHODS IN ENZYMOLOGY; Sohal, R; 378:146-151 (2004)]. But Vitamin E tocopheroxyl radical should be neutralized to prevent it from causing oxidative damage. And unlike CoEnzyme Q, which is synthesized in the cell, Vitamin E must be obtained from the diet. Although 80% of CoEnzyme Q is found in mitochondria, its presence in microsomes, Golgi apparatus and plasma membranes indicates its importance as an endogenously produced lipid-phase antioxidant. Even in mitochondria, up to a third of CoEnzyme Q is bound to mitochondrial membrane proteins, apparently to serve primarily as an antioxidant. Long-lived mammalian species show a greater proportion of mitochondrial membrane-associated CoEnzyme Q than short-lived species [FREE RADICAL BIOLOGY &AMP; MEDICINE; Lass,A; 27(1/2):220-229 (1999)]. The CoQ10 benzoquinone nucleus is synthesized from tyrosine independently of the synthesis of the isoprenoid side-chain — and then the two are joined. The side-chain synthesis begins with acetyl-CoA and proceeds through a sequence of steps, most of which are also needed for cholesterol synthesis. The key enzyme controlling this sequence is HMG-CoA Reductase (causing mevalonate formation), the enzyme which is blocked by statins, the drugs used by people wanting to lower blood LDL cholesterol. Plasma/serum levels of CoQ10 are reduced by about a third (with wide variation) in those taking statins, but insofar as LDL cholesterol is the major plasma carrier of CoQ10, this effect is to be expected. Despite the known inhibition of CoQ10 synthesis by statins, there is insufficient evidence to conclude that myopathy associated with statin use is due to CoQ10 depletion [JOURNAL OF THE AMERICAN COLLEGE OF CARDIOLOGY; Marcoff,L; 49(23):2231-2237 (2007)]. In cells, the highest CoQ10 concentrations are in the Golgi vesicles, mitochondrial membranes, lysosomes and plasma membranes — in that order. Age-related decline in CoQ10 content has been demonstrated for skeletal muscle, but not for other organ tissues [BIOFACTORS; Lass, A; 9:199-205 (1999)]. Human CoQ10 tissue concentration (micrograms of CoQ10 per gram of tissue) varies by at least an order of magnitude from organ to organ, as shown in the table from [BIOCHEMICA ET BIOPHYSICA ACTA; Ernster, L; 1271:195-204 (1995)]. Unfortunately, the high lipophilicity/hydrophobicity of CoEnzyme Q makes it difficult to boost mitochondrial CoQ10 content by dietary means — eating heart or taking supplements. CoQ10 must be ingested with high-fat food such as peanut butter or avocado. Soybean oil capsules increase bioavailability. CoQ10 is transported in the bloodstream attached to VLDL and LDL cholesterol, with a plasma half-life of about 30 hours. Radioactive tracer studies show the highest CoQ10 uptake by spleen, liver and white blood cells, with lower concentrations found in adrenals, ovaries, thymus and heart. Practically no dietary CoQ10 goes to kidney, brain or skeletal muscle [JOURNAL OF NUTRITION; Turunen,M; 129(12):2113-2118 (1999)]. For those tissues that absorb CoQ10, very little goes to the mitochondria. 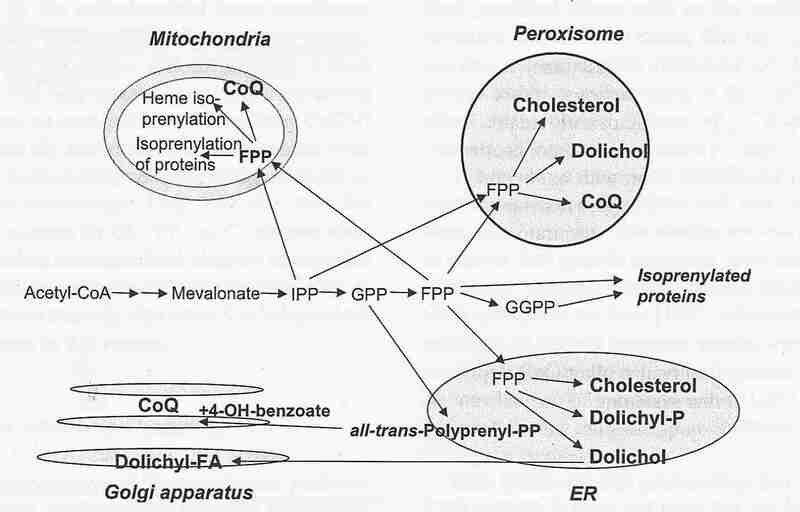 Most CoQ10 either remains in the plasma membrane or is found in lysosomes [FREE RADICAL BIOLOGY AND MEDICINE; Bentinger, M; 34(5):563-575 (2003)]. Nonetheless, when CoQ10 is co-administrated with alpha-tocopherol (Vitamin E), the mitochondrial alpha-tocopherol content is augmented above that which would be found by giving alpha-tocopherol alone [JOURNAL OF NUTRITION; Kamzalov,S; 133(10):3175-3180 (2003)]. Contrary to the usual findings, one eminent group of researchers report increased mitochondrial CoQ9 in the cerebral cortex of old, but not young, rats fed CoQ9 — the effect being to restore CoQ9 to youthful levels [PROCEEDINGS OF THE NATIONAL ACADEMY OF SCIENCES (USA); Matthews, RT; 95(15):8892-8897 (1998)]. The study showed a significant neuroprotective effect of CoQ9. A study of lymphocytes incubated with CoQ10 found a dose-dependent increase in ATP synthesis [MOLECULAR GENETICS AND METABOLISM; Marriage,BJ; 81(4):263-272 (2004)]. Another study also showed good mitochondrial bioavailability from exogenously administered CoQ10 [JOURNAL OF NUTRITION; Kamzalov,S; 133(10):3175-3180 (2003)]. Variable experimental results may be due to variable dosage forms, with ubiquinol−10 being considerably more bioavailable than other forms [MITOCHONDRION; Miles,MV; 7(Suppl):S72-S77 (2007) and REGULATORY TOXICOLOGY AND PHARMACOLOGY; Hosoe,K; 47(1):19-28 (2007)]. Human subjects given 200 milligrams/day of CoQ10 for 2 weeks showed a significant increase in time to exhaustion in exercise testing [JOURNAL OF THE INTERNATIONAL SOCIETY OF SPORTS MEDICINE; Cooke,M; 5:8 (2008)]. CoQ10 has a history as an adjunctive agent in the treatment of cardiovascular disease. In 1974 CoQ10 was approved in Japan as a treatment of congestive heart failure. Clinical trials have shown CoQ10 to improve heart workload capacity and ejection fraction [ANNALS OF CLINICAL BIOCHEMISTRY; Hargreaves, IP; 40:207-218 (2003)]. Vascular oxidative stress that converts nitric oxide to peroxynitrite results in endothelial dysfunction due to reduced availability of nitric oxide for vascular smooth muscle relaxation. By preserving nitric oxide, CoQ10 reduces vasoconstriction and thereby lowers blood pressure [MITROCHONDRION; Pepe,S; 7(Suppl):S154-S167 (2007)]. A meta-analysis of clinical trials using CoQ10 showed an average 16.6 mmHg decrease in systolic blood pressure and an average 8.2 mmHg decrease in diastolic blood pressure for doses ranging from 34 mg/day to 225 mg/day [JOURNAL OF HUMAN HYPERTENSION; Rosenfeldt,FL; 21(4):297-306 (2007)]. Animal and human studies have demonstrated reduction in blood pressure (and reduced requirement for anti-hypertensive drugs) with CoQ10 [THE JOURNAL OF CARDIOVASCULAR NURSING; Sarter, B; 16(4):9-20 (2002)]. CoQ10 supplementation is associated with few adverse effects — a prevalence of less than 1%, most of which are mild gastrointestinal upsets [PHARMACOTHERAPY; Tran, M; 21(7):797-806 (2001)]. But because CoQ10 is a natural substance that cannot be patented, there is little financial incentive for research or for large clinical trials to justify its therapeutic benefits. Outside of mitochondria CoQ10 can be reduced (regenerated) by lipoic acid, which in turn is reduced by a number of reductase enzymes [ARCHIVES OF BIOCHEMISTRY AND BIOPHYSICS; Kozlov, AV; 363(1):148-154 (1999)]. CoQ10 has been shown to protect rat endothelial cells from ischemia-reperfusion injury [SURGERY; Yokoyama,H; 120(2):189-196 (1996)]. Although one study showed CoQ10 protection of rat hippocampal tissue from experimental ischemia [BRAIN RESEARCH BULLETIN; Ostrowski,RP; 53(4):399-407 (2000)], another did not [BRAIN RESEARCH; Li,H; 877(1):7-11 (2000)]. A study of pigs showed that one-month supplementation of 5mg/kg/day CoQ10 for one month increased heart content of CoQ10 by a third and resulted in infact size half that of control after ischemia-reperfusion injury [AMERICAN JOURNAL OF PHYSIOLOGY, HEART AND CIRCULATORY PHYSIOLOGY; Maulik,N; 278:H1084-H1090 (2000)]. Independent of its anti-oxidant effects, CoQ10 has been shown to reduce apoptosis by direct inhibition of the mitochondrial permeability transition pore [JOURNAL OF BIOLOGICAL CHEMISTRY; Papucci,L; 278(30):28220-28228 (2003)]. Human cardiac arrest patients admitted to a hospital within 6 hours of cardiac arrest given a 250 mg loading dose of CoQ10 showed 68% survival compared to 30% of controls. Of the survivors, 36% of the CoQ10 group had good neurological outcome, in contrast to 20% of controls [CIRCULATION; Damian,MS; 110(19):3011-3016 (2004)]. CoQ10 has been shown to protect hearts against both aerobic and ischemic stress [ANNALS OF THE NEW YORK ACADEMY OF SCIENCES; Rosenfeldt,FL; 959:355-359 (2002)]. A lipid soluble anti-oxidant would be expected to boost the immune system (thereby increasing defense against cancer) by protection of immune cell membranes. Studies indicate that this is the case [BIOCHEMICAL ET BIOPHYSICA ACTA; Turunen, M; 1660:171-199 (2004), BIOFACTORS; Hodges, S; 9:365-370 (1999) and CLINICAL BIOCHEMISTRY; Portakal, O; 33(4):279-284 (2000)]. Similarly, CoQ10 may be of benefit as a general anti-aging medication [BIOCHEMIE; Bliznakov, EG; 81:1131-1132 (1999)]. Experiments with nematode worms have shown a 60% lifespan extension by CoEnzyme Q deprivation at the end of the larval stage, but this is probably not relevant to humans. The nematodes (especially those with so-called longevity genes) go into a hibernation-like arrested state dependent upon anerobic metabolism with very little oxidative phosphorylation and free-radical generation [SCIENCE; Larsen, PL; 295:120-123 (2002)]. What may be relevant is that the experiments demonstrate that significant amounts of dietary CoEnzyme Q can indeed get into the mitochondria (in nematodes, at least). Red meat and poultry are the richest dietary sources of CoQ10, but for most people their major source of CoQ10 is production within their own body. CoQ10 supplements are not reported to have side effects, so are quite safe to take.